On July 31, 2016, the Commission on Accreditation for Law Enforcement Agencies (CALEA) awarded accreditation to the Massachusetts Trial Court Officer Training Academy. Thanks to the tremendous work by Heather Brouillette and all the officers who shared in the shaping of the training academy, it has been confirmed that the training methods used by the academy are state-of-the-art and immensely effective. The Public Safety Training Academy Accreditation Program began in 2002, with the purpose of encouraging superior public safety training services. In order to receive accreditation, the program must live up to standards in nine topic areas, including recruitment, instructional systems and instructors. 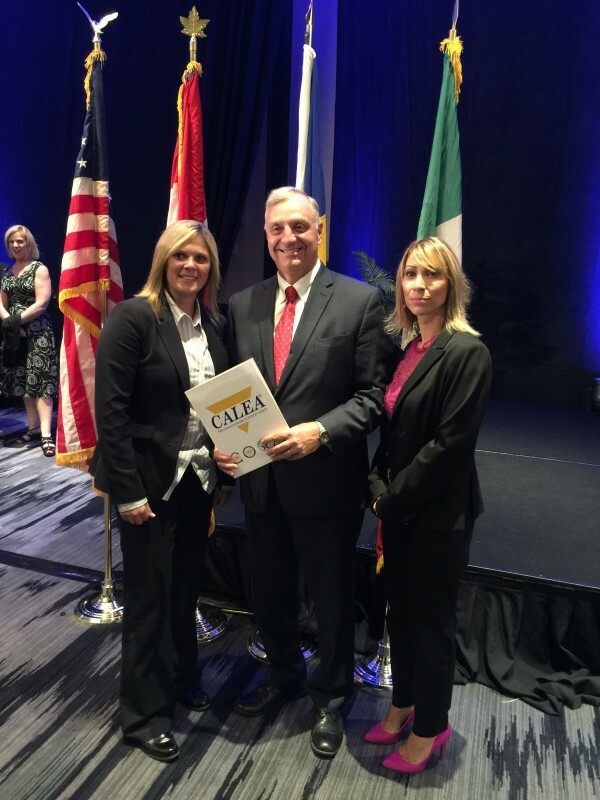 Several representatives from the Trial Court travelled to Baltimore, MD to attend the CALEA Awards Ceremony. Trial Court Local 458 President Dorianna Medieros, along with training manager Heather Brouillette and Director of Security Jeffrey Morrow. Congratulations to the Massachusetts Trial Court Officer Training Academy on this incredible accomplishment! Brouillette, Morrow and Medeiros at the CALEA Awards Ceremony.